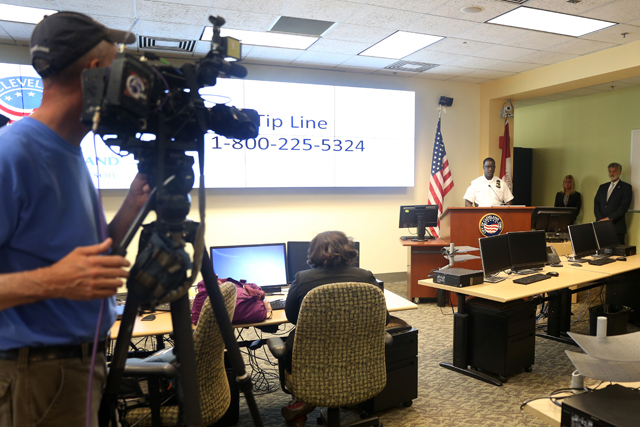 Law enforcement agencies involved in preparing for a safe and secure community and activities surrounding the Republican National Convention have set up a designated tip line for the public to utilize for suspicious information or activity to be reported. This tip line number is 1-800-225-5324. We have our routines every day, going to work, going to school, interacting in our neighborhoods and our communities when we see something that doesn’t fit – we notice. The Division of Police needs the public’s assistance in reporting things that do not fit, things that are out of the ordinary. A vehicle parked in an odd location, a package/luggage that is unattended, a window/door that usually is closed and now it is open, or any other out of the ordinary situations. A person questioning individuals at a level beyond curiosity.Someone paying an unusual amount of attention to buildings beyond a casual or professional interest, about the buildings operations, security procedures and/or personnel, shift changes, etc. Unusual repeated or prolonged observation of buildings, sketching floor plans, taking photographs, etc. Should the public report information regarding statements made by people? Individuals stating or posting that they intend to commit violence in our community against other people or against property are encouraged to report that information to this tip line. It is law enforcement’s job to determine if people making statements about committing violence are credible or not. Law enforcement cannot act on the threat of violence if it is not reported. Law enforcement agencies are challenged every day to balance the civil liberties of U.S. citizens against the need to investigate activities of possible criminal conduct. No matter how offensive to some, we are keenly aware that expressing views by itself is not a crime and the protections afforded under the Constitution cannot be compromised. Law enforcement does not predicate investigative activity solely on the exercise of First Amendment rights, including freedom of religion, or on race or ethnicity.